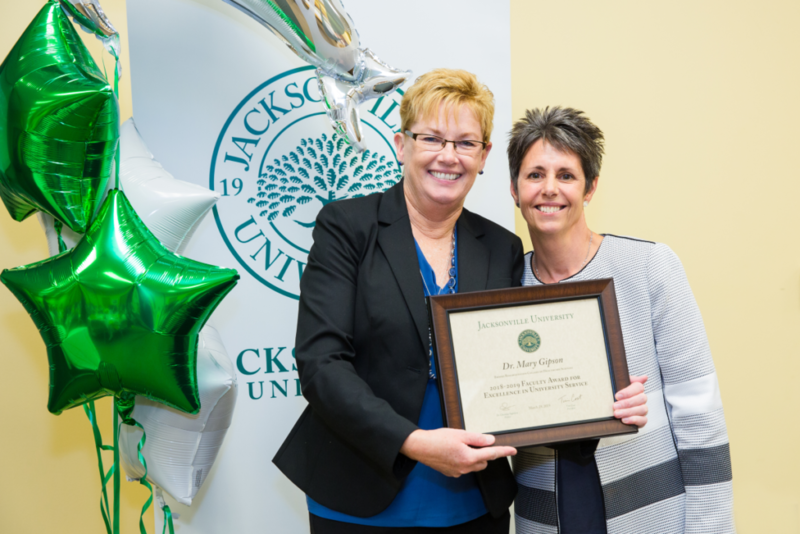 Each year, Jacksonville University faculty members recognize peers who excel in four areas: community service; University service; scholarship and professional activities; and teaching. A selection committee chooses four faculty members who embody each category and announces the winners at the annual Faculty Recognition Dinner. The Faculty Excellence Award honorees for 2019 come from diverse backgrounds and represent a variety of academic programs. But all are outstanding educators who model excellence, compassion and dedication to their peers and their students. Dr. Whitney George, Department Chair and Assistant Professor of Mental Health Counseling. Interim Provost Chris Sapienza (right) congratulates Dr. Whitney George, winner of the 2019 Faculty Excellence Award for Community Service. Photo by Laura Evans. Dr. George is Program Director for Clinical Mental Health Counseling at the Brooks Rehabilitation College of Healthcare Sciences, and she has carried her passion for counseling around the world, in service to others. As a doctoral student, she traveled to Africa to counsel children who had lost their parents or primary caregivers to HIV/AIDS. 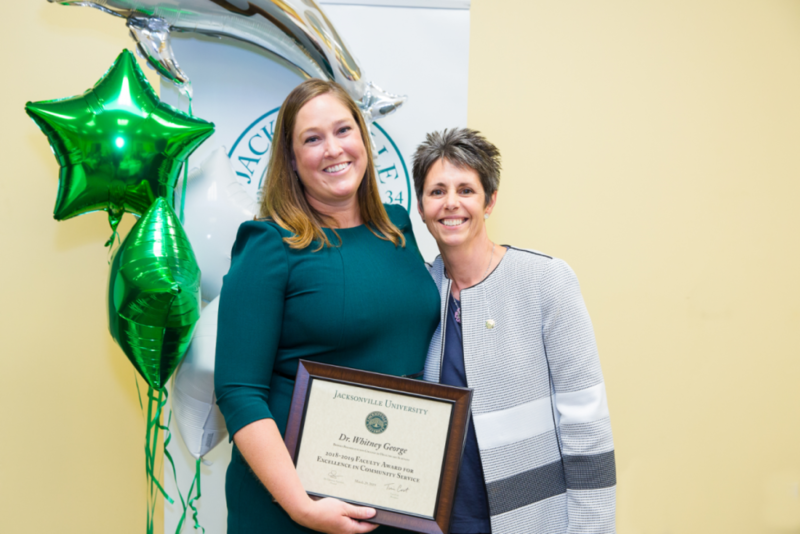 After joining the JU faculty, she co-wrote a grant in 2017 that funds licensed mental health counseling to uninsured and underserved populations at a charitable clinic in western Jacksonville, and she volunteered there herself, providing 350 hours of counseling services. Dr. George is in the process of securing funding for a similar clinic in the Arlington community. She also is highly involved in several community boards and University committees, and this year she was co-chair of the Florida Counseling Association annual conference. Perhaps her greatest act of service is the mentorship and encouragement Dr. George offers students. 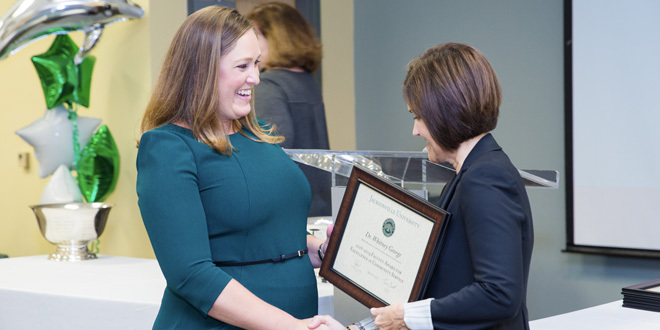 “She models service-minded leadership that will no doubt have a ripple effect throughout the careers of the students she teaches and mentors,” said Professor Nancy Robinson, who presented the award to Dr. George. Dr. George has formed partnerships with more than 40 community agencies to create a pipeline of volunteer opportunities for students and spark a lifelong passion for service. Dr. Mary Gipson (left) accepts the Faculty Excellence Award for University Service from Interim Provost Chris Sapienza. Photo by Laura Evans. Dr. Gipson has been a Professor in the JU Keigwin School of Nursing since 2001, teaching at the undergraduate, graduate and doctorate levels. She has served as a member of the Faculty Executive Committee for several years, including a leadership role as Chair of Faculty for the past two years. In this important role, she works to represent the faculty voice and to partner with University administration to enrich academic opportunities at JU. Dr. Gipson expressed a deep appreciation for serving as faculty leadership, noting the relationships that have been built and the individual and collective contributions that fuel success. She also leads the faculty in the search for new Deans and other academic leadership positions, ensuring the University continues to secure talented educators and innovative leaders that pour into students. Dr. Jorge Majfud (left) is recognized with the Faculty Excellence Award for Scholarship and Professional Activities. Photo by Laura Evans. Born in Uruguay, Dr. Majfud is a celebrated author who has written many Spanish essays, articles and books, both fiction and non-fiction. Several of his novels have been translated into other languages and studied at universities in Europe, the U.S., and Latin America. Among his notable recent works, Crisis explores the experiences of Hispanic people in the U.S., and Tequila takes readers on a fictional adventure fraught with danger, where a group of friends discover some difficult truths about themselves. Dr. Majfud is frequently invited to speak as a guest lecturer or to be interviewed by international media for his expertise on global immigration and Latin American culture. 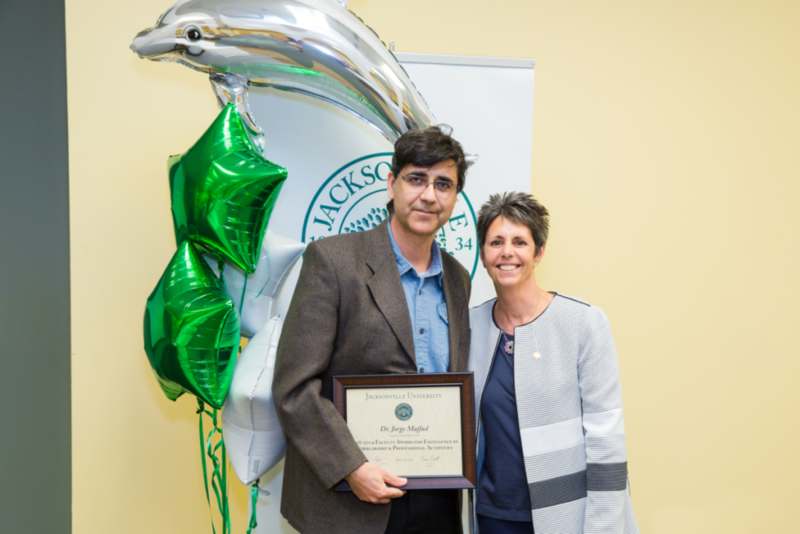 “He truly represents JU worldwide,” said selection committee member Dr. Judy Wingate as she presented him the award. Interim Provost Chis Sapienza (right) congratulates Dr. Sarah Parker, winner of the 2019 Faculty Excellence Award for Teaching. Photo by Laura Evans. 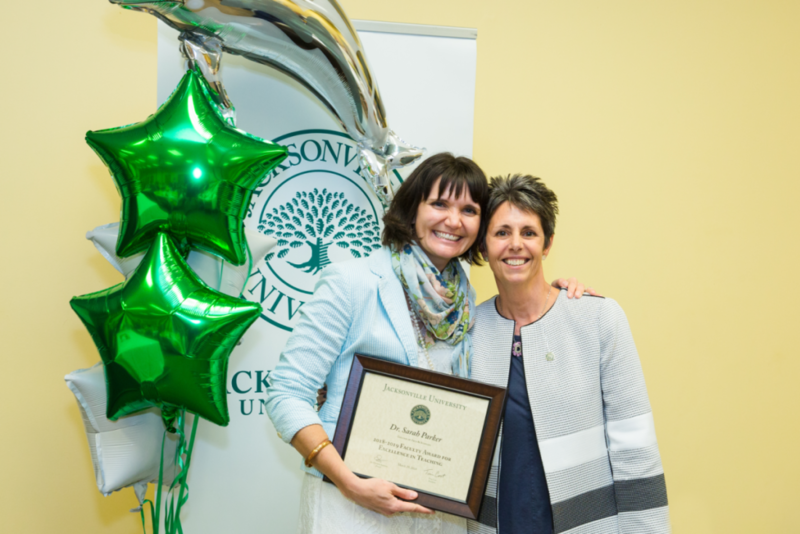 Dr. Parker embodies the supportive-but-challenging academic philosophy that guides Jacksonville University. The Faculty Excellence Awards Selection Committee noted Dr. Parker’s “consistent,” “stellar” and “impressive” teaching evaluations from students, peers and administrators. They also praised her commitment to mentoring and sponsoring undergraduate research. The committee agreed she goes above and beyond in her care for her students. Most notably, Dr. Parker’s teaching philosophy is founded on two pillars: inspiring a love of reading, and igniting a passion for intellectual discovery.